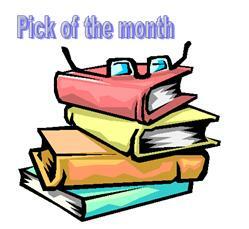 MYSTERIES in PARADISE: Forgotten Books: SLEIGHT OF BODY, Ralph McInerny. This week's contribution to Pattinase's Friday's Forgotten Books comes from my records of 1991. 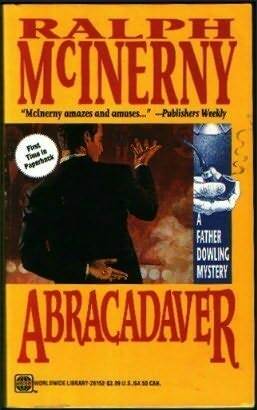 SLEIGHT OF BODY aka ABRACADAVER (1989) is #12 in McInerny's Father Dowling series. For Father Dowling, a ring holds the key to his investigation into the brutal murder of Aggie Miller, a member of his parish, and the disappearance of Frances Grice, the missing wife of a local millionaire entrepreneur. The Father Dowling series consisted of 29 titles published 1977-2009. Ralph McInerney (1929-2010, was a prolific writer who taught for over forty years at the University of Notre Dame, where he was the director of the Jacques Maritain Center. He wrote at least five other series, including one under the pen name Monica Quill. His other pen names included Harry Austin, Matthew FitzRalph, Ernan Mackey, and Edward Mackin. McInerny was awarded the Bouchercon Lifetime Achievement Award, and was a member of the President's Committee on the Arts and Humanities. The following is the synopsis for the Father Dowling Mysteries, a television series that ran in the US 1987-1991. Father Frank Dowling is a Catholic priest who continually stumbles over murders, abductions, and other high crimes in his hometown, Chicago, Illinois. He is assisted by Sister Stephanie "Steve" Oskowski, who does much of the legwork for Frank. Sister Steve is a streetwise nun who grew up in a rough housing project nearby, so she can hotwire a car and handle firearms with ease. She knows the language of the streets and converses in it fluently. Father Philip Prestwick is the ladder-climbing assistant to the Archbishop, who just happens to drop in before meals, prepared by housekeeper Marie Murkin, who provides comic relief. 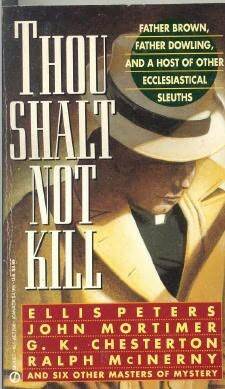 THOU SHALT NOT KILL looks an interesting collection to search for. A collection of mystery stories culled from the pages of Alfred Hitchcock's Mystery Magazine and Ellery Queen's Mystery Magazine features the work of John Mortimer, G. K. Chesterton, Ralph McInerny, and others..
N.B. Friday's Forgotten Books will be in "holiday" mode on 24th December and 31st December. 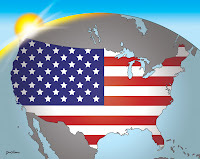 Normal postings will resume on 6 January 2011. I read a bunch of Ralph McInerney novels about 20 years ago. Time to read some more. I read a lot of him too. Good fun. Abracadaver is a title that would make me reach for my wallet.